east of Salt Lake City (I-80 exit #134) on Saturday, February 7.
a Front Runner station platform as the train comes in to the station. defensive shooting and is included in the event fee. Registration starts at 8:25 a.m. 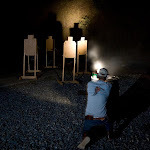 Handgun shooting exercises start at 9:00 a.m.
typically precludes use of shoulder holsters and many cross-draw holsters.